NEW YORK — Oct. 25, 2012 — Microsoft Corp. today announced the global availability of its popular Windows operating system, Windows 8. 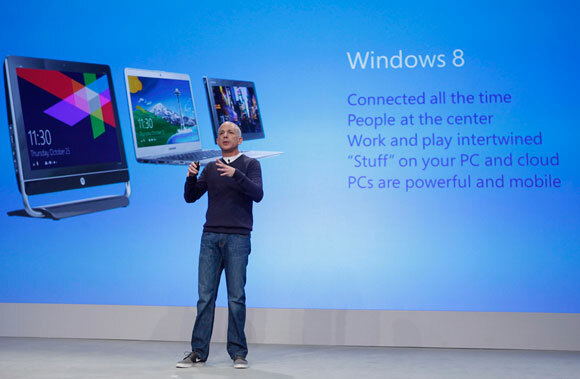 Beginning Friday, Oct. 26, consumers and businesses worldwide will be able to experience all that Windows 8 has to offer, including a beautiful new user interface and a wide range of applications with the grand opening of the Windows Store. As a result of close work with hardware partners, more than 1,000 certified PCs and tablets, including Microsoft Surface, will be available for the launch of Windows 8 — making it the best lineup of PCs ever across the Windows 8 and Windows RT ecosystem. Windows 8 will be available for download to upgrade existing PCs in more than 140 markets and 37 languages at http://www.windows.com/buy beginning at 12:01 a.m. local time and at retail locations around the world. At retail, Windows 8 will be available in two primary versions — Windows 8 and Windows 8 Pro — as well as Windows 8 Enterprise for large organizations. Launching at the same time is a new member of the Windows family — Windows RT — designed for ARM-based tablets and available pre-installed on new devices. In addition to Microsoft Office 2013, Windows RT is designed exclusively for apps in the new Windows Store. Windows 8 features the new fast and fluid Start screen that gives people one-click access to the apps and content they care most about. It also features an entirely new Internet Explorer 10 that is perfect for touch, and built-in cloud capabilities with SkyDrive. Windows 8 can be purchased in a variety of ways from the world’s leading retailers, including Amazon, Best Buy and Staples in the U.S., Casas Bahia in Brazil, Future Shop and Staples in Canada, Suning in China, Media Markt across Europe, FNAC in France, Yamada in Japan, Telmex in Mexico, Dixons in the U.K., and many more, which will feature a variety of offers for customers looking for great deals on Windows 8 PCs, devices and software. Consumers can go tohttp://www.windows.com/shop to learn about the large array of Windows 8 devices available and find the one that best fits their needs. More information on the great offers around the world is available at http://www.blogs.windows.com. In addition to the range of new Windows-based devices available, consumers can also upgrade their existing PCs. Through the end of January, consumers currently running PCs with Windows XP, Windows Vista or Windows 7 are qualified to download an upgrade to Windows 8 Pro for an estimated retail price of US$39.99. And eligible Windows 7 PCs purchased between June 2, 2012, and Jan. 31, 2013, in more than 140 markets can download an upgrade to Windows 8 Pro for an estimated retail price of US$14.99 with the Windows Upgrade Offer, available athttp://www.windowsupgradeoffer.com.